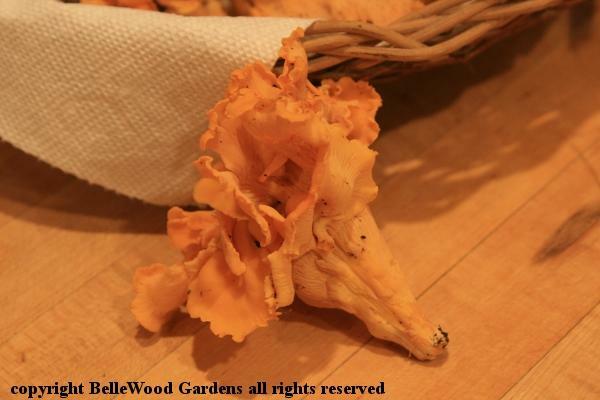 Rain yesterday, more today - it is a fabulous season for chanterelles. Saw something out the car window as we drove down our driveway. Went out in late afternoon. Used the hem of my jersey to make a "gathering basket." Would have gotten more but the rain started up again. 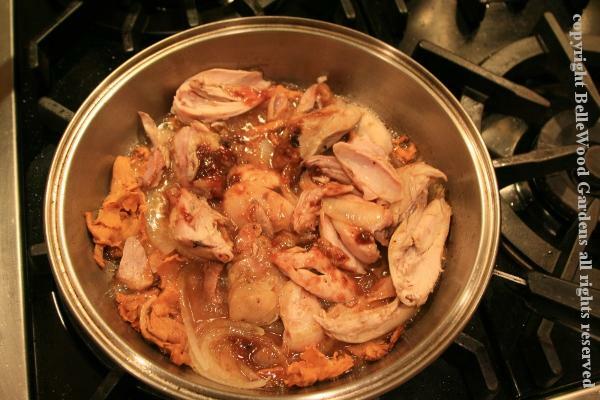 For dinner I made a skillet full of leftover barbecued chicken thighs, stripping meat off the bone, together with thin sliced sauteed onions and - what else - chanterelles - served over rice. Excellent meal! Looks good Jam Lady. 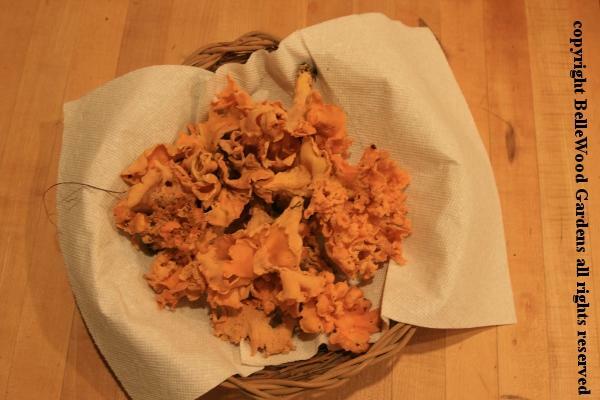 We had some chanterelles come up in our store tent in the woods one year, so I will look out for them there. Lovely chanterelles! I haven't had any for years. We used to get them in a particular place when I lived near Criccieth, North Wales, but that was a long time ago. The specialities round here are parasol mushrooms, they grow on the side of our lane (no traffic) and also occasionally in the hedge down the B road. I once went down to the village and spotted one on the way, specially bought some bacon, and when I came back up the road 15 minutes later somebody had taken it!! I have had the most wonderful giant puffballs, simply delicious sliced and fried with butter, garlic and parsley. Haven't had any lately. There are sometimes ordinary field mushrooms in my fields, but not for ages. knife, brush and at least some sort of collecting container ( dilly bags are ace pocket kit ) at all times, never leave em for later as ..... sorry , i've done it. Looks good Jam Lady. Nice haul. I wish I knew my shrooms and had the courage to eat them. I am what my friends in the New Jersey Mycological Association refer to as a pot hunter. They adore all things mushroom while I am only interested in deliciously edible, easily identified mushrooms. Of which I know about six and ignore anything else.